Cleveland GiveCamp (@CleGiveCamp) weekend on July 29-31, 2016, marked the seventh year of serving nonprofits from the Cleveland and Akron areas. I am fortunate to to be part of Cleveland GiveCamp every year. In 2014, Cleveland GiveCamp volunteer Heidi Cool (@hacool) wrote "CodeSmiths share their GiveCamp experience" to describe my family's involvement in year five. I like the term "CodeSmiths," and enjoy using it here as I share a bit of what my sons and I did at Cleveland GiveCamp this year. I am very proud that now, as adults, my sons continue to be active in helping local charities as Cleveland GiveCamp volunteers. Mike Smith is now an "old-timer" at Cleveland GiveCamp. He volunteered the first year (2010), working on his first WordPress website, and has only missed Cleveland GiveCamp once in all these years. (See @WEWS's Volunteers help local groups with websites 2010 video [at 0:48], which was shared for "Throwback Thusday" on Twitter here.) This year, Mike contributed to building a WordPress website for Loyola Retreat House, Inc. This was Kevin Smith's fourth year working on the Cleveland GiveCamp social media team. In addition to contributing to the @CleGiveCamp Twitter feed and posting to Facebook.com/CLEGiveCamp, he was responsible for creating the official Cleveland GiveCamp YouTube video for the third consecutive year. Once other teams building websites learned that Kevin had video editing experience, the Loyola Retreat House, Inc. and EYEJ: Empowering Youth, Exploring Justice (@eyejcleveland) teams had him edit videos to be used for their new websites. Here is the Loyola Retreat House video which will act as an online tour of the retreat house. View and share 2016 via Facebook Video here. I continue to work on the Cleveland GiveCamp Steering Committee year-round, assisting with the planning for the weekend, managing the ClevelandGiveCamp.org website, and coordinating some of the social media activities. During this year's Cleveland GiveCamp weekend, I served with my son Kevin on the social media team. Here are my photos and videos from Cleveland GiveCamp weekend. In the list below of other bloggers who wrote about the weekend, you will note that I contributed my photos for others to use. Here is the list of the 19 Cleveland GiveCamp Nonprofit Partners for 2016 (one nonprofit lost the opportunity since their representative could not attend the weekend). All received a new or updated website, except for Neighborhood Housing Services of Greater Cleveland, which had a security team audit, and The Nightlight Cinema, which received a special data management dashboard. For 2016, there were enough volunteers to also create a 20th team which worked on updating the Cleveland GiveCamp website. I look forward to promoting Cleveland GiveCamp 2017 on the new website when it goes live. Euclid Hunger Task Force, Inc. Please read my PechaKucha Night at the Akron Civic Theatre blog post to learn more about The Nightlight Cinema Executive Director Kurtiss Hare's PechaKucha Night Akron (@PKAkron) talk. A big thank-you to the Cleveland GiveCamp sponsors who make it possible to serve the Cleveland GiveCamp Nonprofit Partners. Here is the list of 2016 sponsors, along with information from the Cleveland GiveCamp sponsors official web page explaining their importance. Cleveland GiveCamp could not happen without the generosity of our sponsors. Their financial and in-kind support helps us continue the important work we do each year. A typical project created during GiveCamp weekend would cost a nonprofit $5,000-$10,000. By doing them for free, we allow them to allocate their financial resources to directly fulfill their mission. Thank you to our Cleveland GiveCamp Sponsors. The Cleveland Section of the Institute of Electrical and Electronics Engineers (IEEE) is Cleveland GiveCamp’s fiscal sponsor. The IEEE is a tax-exempt organization, under IRS section 501(c)(3), and is eligible to receive charitable contributions that are deductible for U.S. income tax purposes. If you would like to make donation to the Cleveland GiveCamp, please use the PayPal button below. Payments are made through the Institute of Electronics Engineers (IEEE), our fiscal sponsor. Of special note is the unique and beautiful location for Cleveland GiveCamp. Thank you, Arras Keathley Agency (@AKACleveland), Burke Lakefront Airport (@BurkeLakefront), and LeanDog (@LeanDog). Be sure to see the photos I share in my slideshow and on Twitter to see what it was like for the teams working in the Arras Keathley Agency and LeanDog offices, which are located on a boat! In addition, Burke Lakefront Airport is filled with interesting technology and historical displays from the International Women's Air & Space Museum (@WomenintheAir). Incredible views of Cleveland's Terminal Tower (@TowerLightsCLE), Rock & Roll Hall of Fame (@Rock_Hall), Great Lakes Science Center (@GLScienceCtr), USS COD Submarine (@SubmarineCod - @USSCod), and the city skyline can be seen during Cleveland GiveCamp -- It is just a great place to work for the weekend. 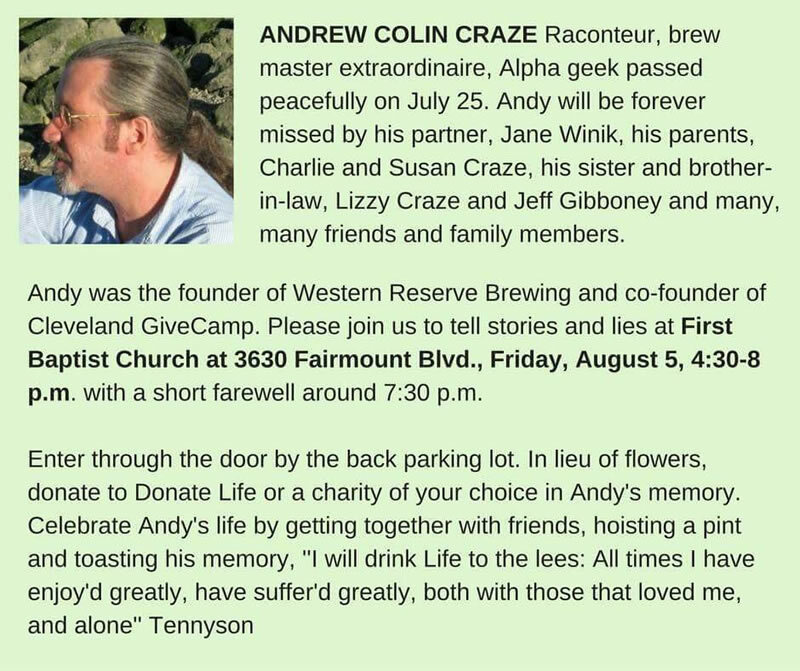 Cleveland GiveCamp co-founder Andy Craze passed away on Sunday, July 24, 2016, one week before everyone came together to help local nonprofits at Cleveland GiveCamp. The weekend was a fitting tribute to what he started in our city, and which will continue on into the future. Andy used to run the stand-up meetings at Cleveland GiveCamp, so in his honor, there was a moment of silence at the first stand-up meeting of the weekend. My son, Kevin Smith, came up with the idea of adding a tribute to Andy to the official Cleveland GiveCamp 2016 YouTube video, and worked with Andy's partner, Jane Winik, to choose appropriate photos. At the Cleveland GiveCamp closing ceremony, Andy's partner, Jane Winik, along with Bob Coppedge of Simplex-IT (@Simplex_IT), surprised all the attendees by announcing the creation of the annual “Craze eCool Award” with the goal of supporting a local nonprofit with a cash donation in memory of Andy Craze. Attending the August 5, 2016, Andy Craze memorial, I learned more about Andy's life. It was an honor to know him. Here are my @sos_jr tweets and retweets sharing the experience which was Cleveland GiveCamp 2016. Please share any photos and videos that you find interesting by retweeting. Clicking on Twitter photos will enlarge them! Note that I organized them into five sections. For all seven years, Cleveland GiveCamp volunteer Heidi Cool (@hacool) has provided tech assistance and training for WordPress (@WordPress) web software. See her Care and Feeding of your WordPress Site website for resources she used during the training. Slack (@SlackHQ) -- "A messaging app for teams" -- was used during Cleveland GiveCamp to communicate to all teams. Also, some teams created their own Slack channel. Here is a screenshot of Cleveland GiveCamp Steering Committee member Jonathan Knapp's (@cc_jonknapp) Cleveland GiveCamp Slack welcome message. "Slack is free to use for as long as you want, for teams of all sizes" -- see the pricing guide for more information. In my Cleveland GiveCamp 2014 - 5th Year! blog post, I also have a list of resources you might find useful. It was shared at Cleveland GiveCamp that the Lynda.com (@lynda) online learning platform for business, software, technology, and creative skills is now available for free through local libraries! This can be very useful for the nonprofits' leaders/volunteers wanting Lynda.com WordPress classes to assist them in managing their new websites. "Volunteer 4 hours and receive 2 tickets to a select Indians Game" - During Cleveland GiveCamp, volunteers were encouraged to sign up for these free tickets, since they put in many, many more hours than the minimum number required. Of more importance is that Cleveland area nonprofits should know that this Indians (@Indians) game offer was NOT a Cleveland GiveCamp program, but open to ALL nonprofits. Spread the word so more nonprofits use this program to thank their volunteers. Nonprofit Technology & Communications Summit - Check out the website at BVUtech.org for all the details of this Friday, September 30, 2016, technology event for nonprofits. Thank you to Melanie Meyer for suggesting that Cleveland GiveCamp have a table at the event. I look forward to participating. If you are interested in GiveCamp (@GiveCamp) in other cities around our nation, please check out the Twitter list that I developed for @CleGiveCamp. Not all these groups are active, so check their Twitter feeds and websites to see if they are meeting. Many other GiveCamps occur in the fall. Here are some of the articles and blog posts about Cleveland GiveCamp 2016. I always like to include what others have shared about events I attend. If you know of additional blogs/articles, please feel free to add a comment below or mention it to me at my @sos_jr Twitter account. See the section of the article about LeanDog sponsoring Cleveland GiveCamp. A BIG thank-you to Kevin for the kind words about my volunteer work in his blog post! Thank you again, Kevin, for mentioning me in your blog post. I contributed a photo to Coffee and Code's blog post. I contributed photos to Simplex-IT's blog post. Thank you, James, for including my tweet in your Army of Minions blog post about GiveCamp 2016. 2017 will be the eighth year that Cleveland GiveCamp volunteers will provide free tech solutions to local charities. Please tell everyone you know about this opportunity for nonprofits. We want to let nonprofits that don't know about this resource learn how to apply to be served in future years. Thank you.